I lost a good segment of the second part of last week to a migraine. It's not often that they catch me off guard these days, but this one did, then it lurked around for a few days after. So, I'm on catch up again this week. Oh well, I'd be bored if I didn't have to rush around trying to fit too much into not enough time! Oh this is so gorgeous Faye love the little boy image. Ohh... I hate it when a migraine comes to bother me! I know exactly how you feel!!!! Mine always goes away after I throw up, but that can take days before that happens! I really don't know why you don't play more with your blue Copics, cause this is really GREAT!!! Love the shirt! This is wonderful Faye. That image is adorable and your colouring is amazing! I love those wooden stars too. what a fab blue card, just love the image and the colours, + the great sketch. Gorgeous card Faye. 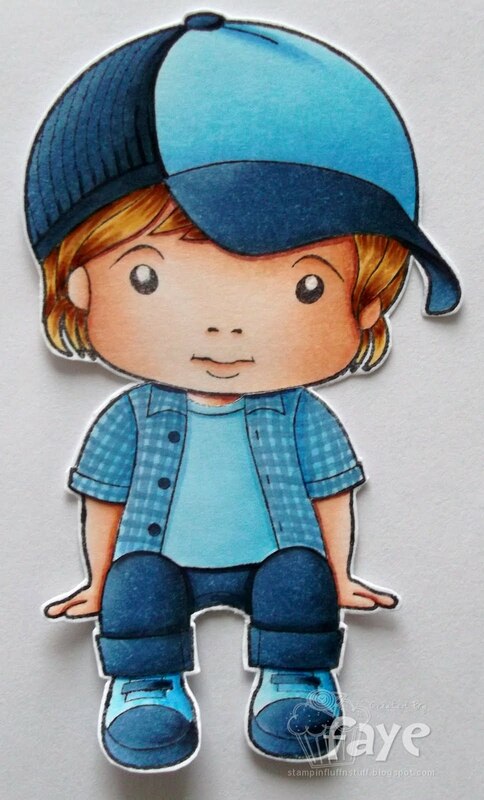 I love the image, he's adorable and gorgeous shades of blue too. Fabolous card Faye,love the blues!! Great card Faye and great monochromatic blue colour. Hope your feeling better now. This is adorable, Faye! Fantastic coloring of the cute image! Sure hope your migraine is gone now. They are no fun! I'm so in love with this! The papers, the twine, the stars....and of course, your coloring is just amazing!! Such a fantastic card! this is just too cute..I love your coloring and those added stars are perfect...great card..
Hi Faye, ahhhh migraines - little beggers ain't they! Luckily I've not had a bad one for some years but I still get major headaches from time to time. Fabulous card - love the blues, such deep shades! Great papers as well and the little stars are so cute. PS - Yes that was my first attempt with the R80 thingies - thanks again for the advice, maybe I neeeed more Copics too!! Not nearly as bad as I remember them, tho I do feel bad for the poor Promarkers, feel like I'm being disloyal! I need more time!! Howd you get Sweet Cheeks to sit for so long whilst you coloured him in!!!! p.s. run outta jellie beanz yet? SUPER CUTE!!! Love that precious image and your card is outstanding! Gorgeous as ever Faye!! Love this little sweetie and you've coloured him perfectly! Hope the migraines stay away! Beautiful card Faye, love the sweet image and fab design. Ooooh this is luvverly Mrs F, fab colouring and such a sweet design, gotta love those little stars in the corners! Super cute image and Sweet card! I love it all! Wonderful card! Love the little stars, the perfect touch! Super cute! I need some of your magical coloring power! Send me some! Love the blue hues and the stars. This image is beautifully colored in blues! 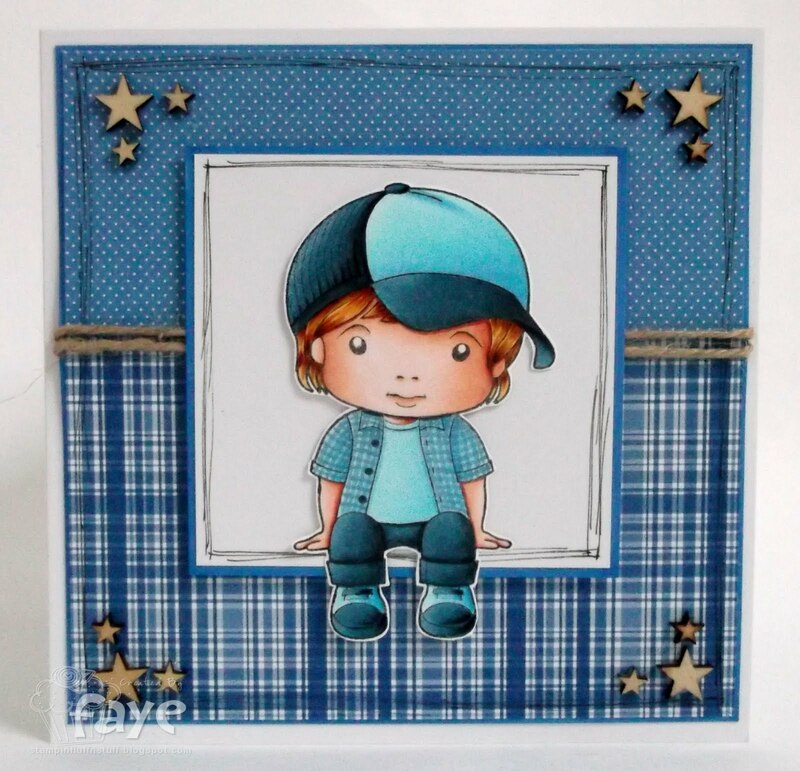 A fab layout for a boy's card - love the stars, twine and doodled lines - great details! Fabulous card Faye - amazing colouring - such depth and I love the little stars. Hope the migraine has gone and stays gone! You struggled with this card???!!! I LOVE LOVE love it!!! You should do more blue cards, since you rock them! Hope you kicked the migraine to the curve!! HUgs and sunshine! Super cute card Faye, love the stars & twine. Absolutely adorable Faye. Doesn't look like you struggled with him at all! 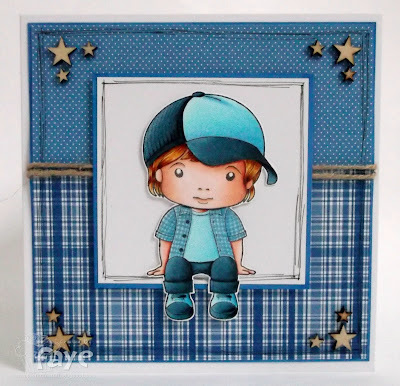 Gorgeous card Faye, love the image...he's a little cutie! Me again! Stalking you, as usual!! Are you worried - you should be! Seriously I'm just popping back to say thanks for joining in with us at Sweet Stampin this week as well.